DICEL ELECTRONICS is specialized for over 35 years in the field of power conversion products with the aim to provide tailored solutions to the needs of our customers. Anxious to offer optimized solutions, DICEL ELECTRONICS focused on the concept of service and listening in order to understand each customer constraints and be able to offer the most suitable solution. This is why we offer a wide range of products from our partners, which we distribute in France, listed on this site. 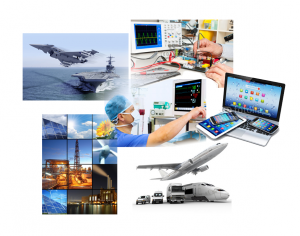 These partners were selected so as to meet our customer’s needs in the various fields of activity as Industrial field, Medical, Transportation, Military, Telecom and Test & Measurement. Each partner has technical specificities in order to offer the most complete range of solutions for our customers. Our special relationship with them and our strong technical skills, help to bring the presence and support which are essential for our customers as well as the possibility to deal with semi-custom or full-custom solutions. If the standard range doesn’t match your need, we are able to orientate you on adaptations or the development of tailor-made solutions, with great flexibility. Always keen to improve our performance to our customers, we expanded our services to other products revolving around power conversion like: Surge protection, EMC Filtering, Solid State Relays and Sensors. Thus, our customers can see DICEL ELECTRONICS as a complete partner in order to meet their different needs with only a single contact. Do not hesitate to contact us and to explain your requirements and constraints so that we can guide you on the most suitable solution.